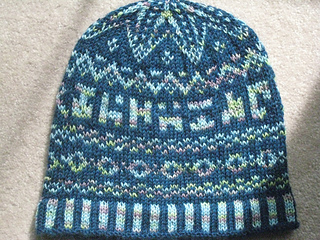 Since the second season of SGU is about to begin, I thought it might be nice to design a Fair Isle SGU hat. I wanted to include a gate address for Destiny. But, I wasn’t sure what else to include until reading Joseph Mallozzi’s weblog of August 28th, 2010 -- which included a picture of Destiny written in Alteran. So, that’s how this hat was born. While knitting the hat, I decided to make a few minor changes. …. Both versions of the pattern are here.